It’s great to see this show make a return to the Fringe after many years and Beyond Broadway Productions do an excellent job of squeezing every ounce of entertainment from the piece. Set in, well, an American Trailer Park we follow the stories, relationships and plot twists of several of the residents as they struggle to cope with life. 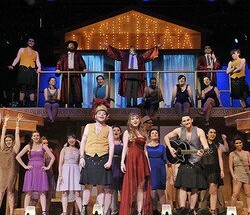 The songs are great and the cast as an ensemble sound fabulous with perfect harmonies and high energy. As soloists, they bring their characters to life with good attention to detail and humour. Lots of humour! Direction makes excellent use of the space, including the side rows of seats, and has the cast singing and dancing all over the place – you are in for a treat no matter where you sit. Lighting is well used throughout, effectively placing us in the trailer park. The three-piece band are also excellent, not too loud but still driving the funkiness throughout the show. My only niggle was that while the ensemble are impressively strong, sometimes the occasional solo lines were a bit lost if you were sitting at the sides. An excellent night out and one of the best musical productions this year, funny, energetic and very enjoyable.